"At the start of 2016, I made a decision to only pursue the things I love, while making an impact on this world. I quit my sales job and began the search for finding my natural aptitudes. Looking to my past, I was always passionate about building ecosystems. In my youth, that meant making fishtanks and building ponds for my turtles. Today, it’s translated into Farmwall. But creating a sustainable ecosystem where we can work and play in cohesion with nature, relies on a serious attitude change. To trigger this, we thought of designing a scaled down, indoor farm for cafes and restaurants. The thinking behind it was, If we have to start small, how can we have the largest reach? By growing fresh herbs and microgreens inside cafes and restaurants, we can reduce packaging waste and high food files while introducing quality and freshness into Melbourne's hospitality scene. Farmwalls are in essence, a communication tool to reconnect patrons with the origins of their food. 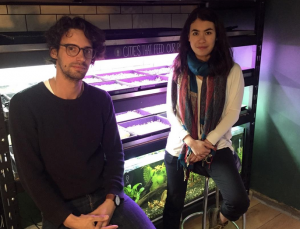 We want to transform our cities into food producing ecosystems. To do this, we need to change the way we think about food by reconnecting consumers with the origins of what’s on their plate. We’re very excited to announce our first venue, Higher Ground in the heart of Melbourne’s CBD. It’s an award winning location known for its innovative menu and lush greenery. It’s the perfect spot for our launch! We also just signed the lease for a 1000sqm plot of land, a few kilometers from Melbourne CBD, for our urban aquaponic farm. This farm will support our local Farmwalls, and inspire more people who get to see first hand, the advantages of transforming our cities into food producing ecosystems."